Our company is a top choice for dryer repair in Jersey City, New Jersey.We are here to take care of any job in a timely and effective manner. These days, it’s nearly impossible to imagine life without laundry room appliances. There is a vast variety of top and front load washers and dryers installed in virtually every household across the area. It’s no wonder that more and more people start depending on them daily.Thus, it can be quite frustrating to face their unexpected breakdown. But put your worries aside! 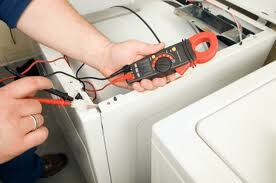 Just phone us and a trusted dryer technician of Jersey City will be there in a flash. Wherever you are, the pro will show up on time and carry out the required task to your expectations! Have you bought a brand new unit? Call us for dryer installation! Dryer installation is a task for a skilled tech – there’s no doubt about it. So do yourself a favor and distance yourself from any mistakes by calling us. We are at the ready to provide you with a licensed dryer service technician that has the expertise to install any unit with no fuss. That way, you will be able to start using your appliance then and there. But not only that! The Jersey City dryer technician will inform you about our annual maintenance check-ups that will prevent any major problems down the line. When it comes to a wise investment, you can’t go wrong with this one. Just think about it!